A fine example of our cabinet making. Stylish yet functional, these storage units were designed to complement this angular space and accentuate the colour palette of the bedroom’s interiors. 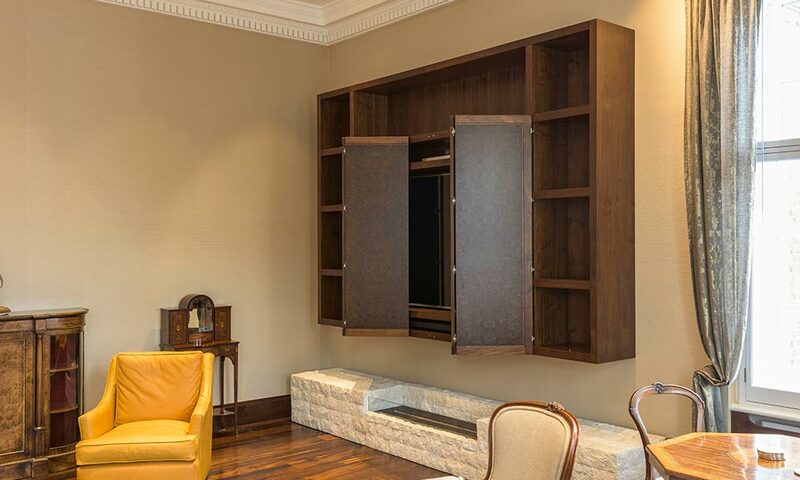 Sweeping from floor to ceiling and wall-to-wall, these all-enveloping wardrobes provide the storage solution many still seek. 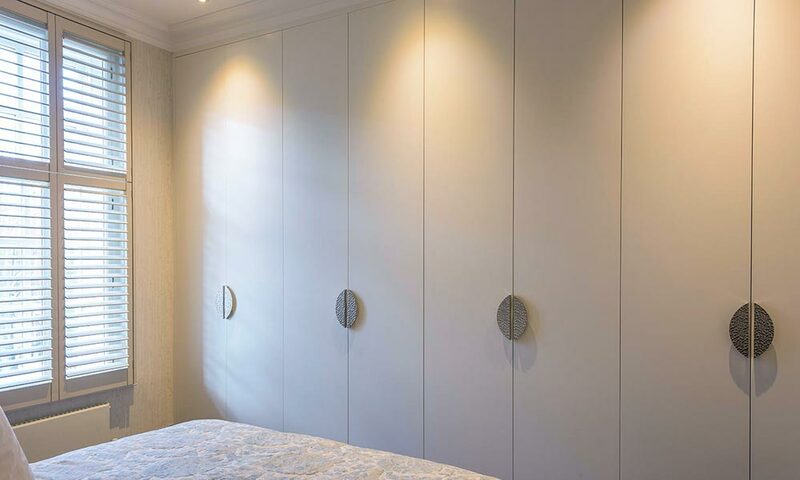 The wardrobes are fully fitted throughout, the finer details evident from our quality finishing, such as the interior LED lighting. A solid, eye-catching centrepiece for any room, this media unit fills a wall with a beautiful walnut grain. Cleverly designed to keep tech out of sight when not in use, the folding doors operate stylishly across the centre. If you are looking for highly skilled craftsmen with decades of experience in carpentry and joinery, that’s exactly who we are. Established in the capital, we work across the southeast bringing customers’ furniture design ideas to life. At LDN Furniture we are what we do. We advise, we assist, we design, we draw, we budget, we lead, we deliver. We make. From our north London workshop we produce handcrafted furniture and joinery pieces of the highest quality. 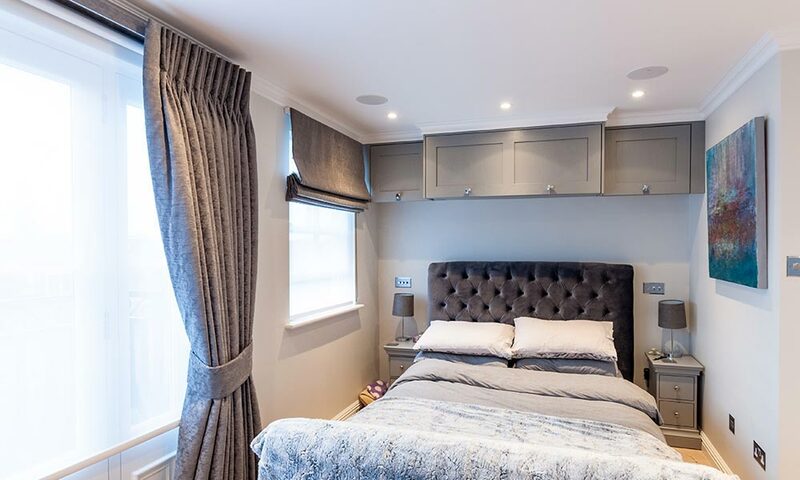 Bespoke cabinets, fitted media units, custom bookcases, floor to ceiling wood panelling or a dream set of kitchen cabinets – whatever you would like created, we can make. As providers of a bespoke service, we are here to assist and advise you. We work with architects and interior designers on larger projects but also love collaborating with the individual who has a furniture idea they wish to have made. LDN Furniture is here to make it a reality. Our furniture looks even better on a floor or a wall than it does in your head. Please get in touch; we can’t wait to hear about your idea. If you'd like to know our story so far, you can discover more on the About Us page. Our work. Our methods. Our philosophy. Who are we? Lovers of beautifully crafted, bespoke furniture. Just like you. "The shelving is amazing. LDN Furniture can't be faulted. Hardworking, talented people. Thank you!"